Lighter version of a classic Chicken Marsala recipe. To make this Chicken Marsala lighter, I got rid of the breading and flour, substituted butter substitute for butter, and used low sodium chicken broth. 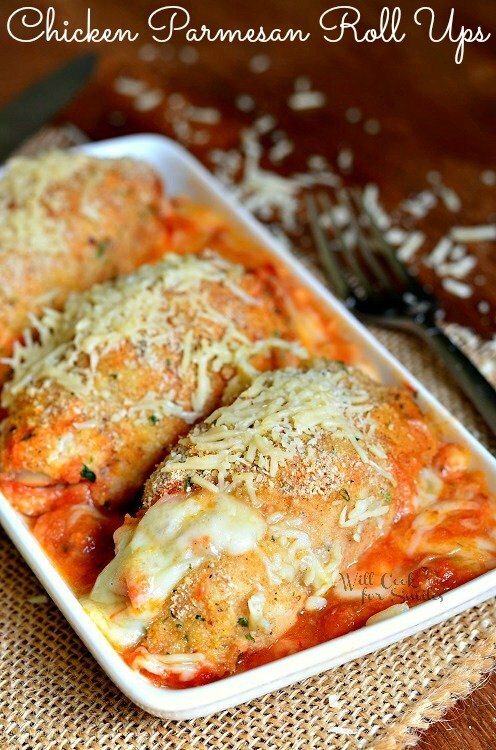 For an extra special touch, I stuffed chicken with a couple of slices of part-skim mozzarella cheese. Do you have those family favorite dinners that everyone loves so much but you try not to make it too often, so you don’t get tired of it? We definitely do. We have a few favorites that I make once every few months so it’s exciting every time! 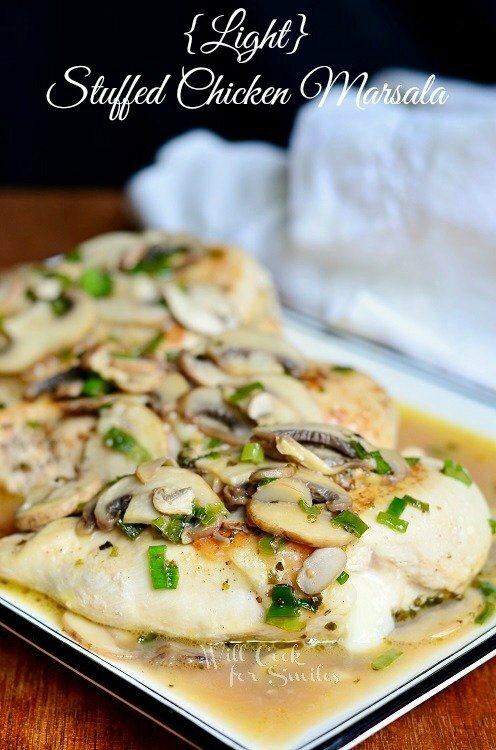 Chicken Marsala is a classic that will always be a great go-to meal. Whether you are cooking for holidays or a quiet family night. I decided to spruce up my recipe with a few delicious changes. For one, I made this chicken stuffed with some part-skim mozzarella, which added so much extra flavor. I ditched the breading to make it healthier. Here is a secret, cooking the chicken breast in the pan without any breading to golden brown, brings out so much more flavor than any breading can provide. Hello, it’s healthier too! 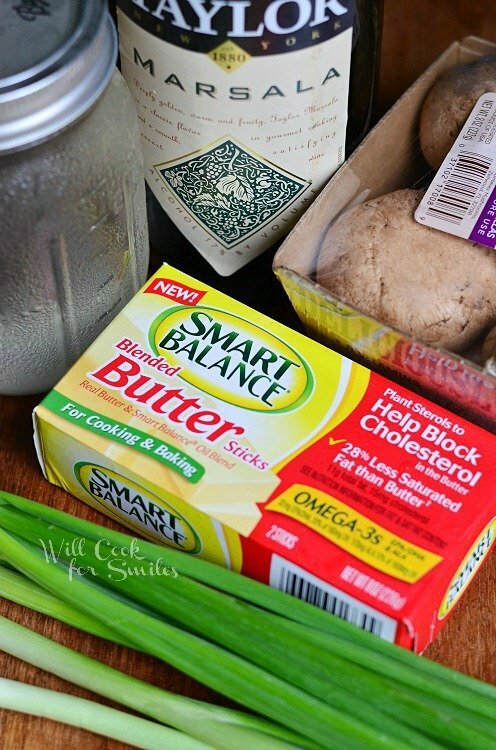 Another change I made was using Smart Balance butter in this recipe. Smart Balance products are made without hydrogenated or partially hydrogenated oils, and they naturally have 0g trans fat. Their products contain a unique natural blend of polyunsaturated, monounsaturated and saturated fats designed to help improve cholesterol levels. Smart balance butter sticks and spreadable butter are 1 to 1 substitution for butter in recipes, you are just making a smarter choice. To make this Chicken Marsala lighter, I got rid of the breading and flour, substituted butter substitute for butter, and used low sodium chicken broth. 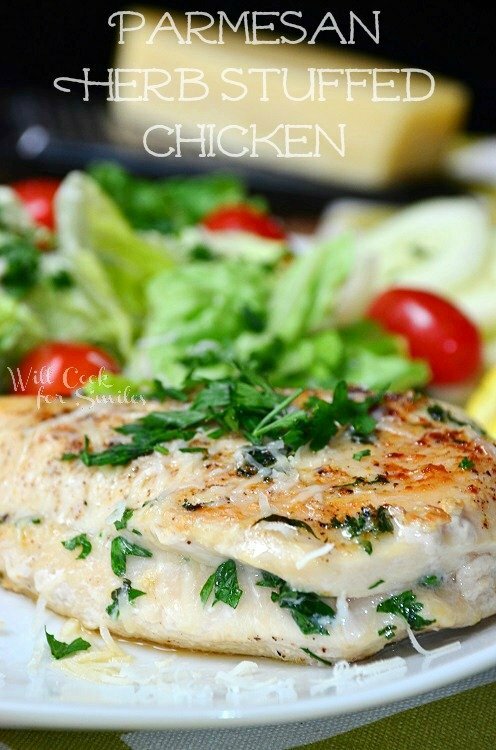 Lay the chicken breast flat on the cutting board. Carefully, slide the knife (hold it sideways with blade facing away from you) at the top (larger part) of the chicken breast in the center and cut a pocket in the middle. DO NOT slice all the way through the bottom or the sides of the chicken breast. Your ultimate goal is to create a pocket inside the breast with opening at the top. Repeat with all three breasts. Slice the cheese into thin slices and stuff the chicken with 3-4 slices each. Make sure the cheese is even throughout the chicken pocket. Salt and pepper outside of the chicken. Preheat a large pan on medium heat and melt the Smart Balance butter in it. Add the stuffed chicken breasts. Cook on medium heat until done making sure that both sides get nice and golden (lots of flavor comes from the chicken cooked to golden brown). Take out the chicken. In the same pan, add the mushrooms, marjoram and green onion. Saute for a couple of minutes. Add Marsala wine and chicken broth. Add a some salt to taste. Bring to low boil on medium-high heat and then turn the heat to medium-low once you see bubbles. Add the chicken back to the pan and cook for about 7-10 minutes, turning the chicken half way so both sides get even cooking. Originally posted on Will Cook For Smiles on January 8, 2014. Looks delicious! I agree, chicken browned in a skillet has wonderful flavor, who needs breading! This looks fabulous Lyuba! Love that you were able to lighten it up too! 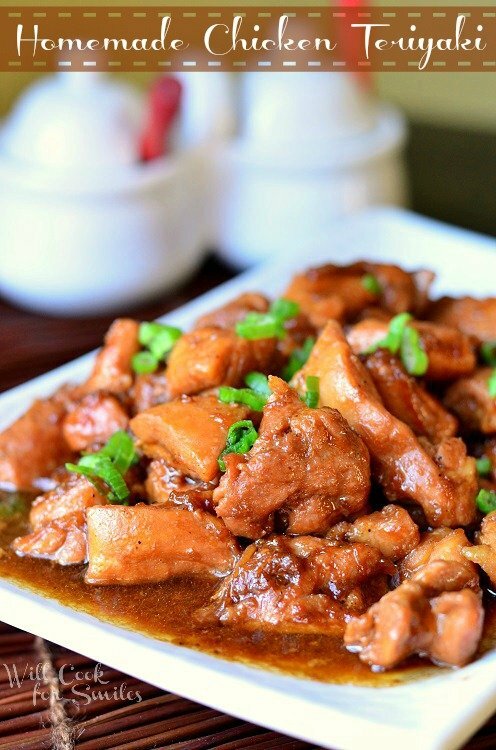 I think I could have chicken every night and this looks delicious! Thank you, Tonia! Same here, there is so much you can do with chicken! 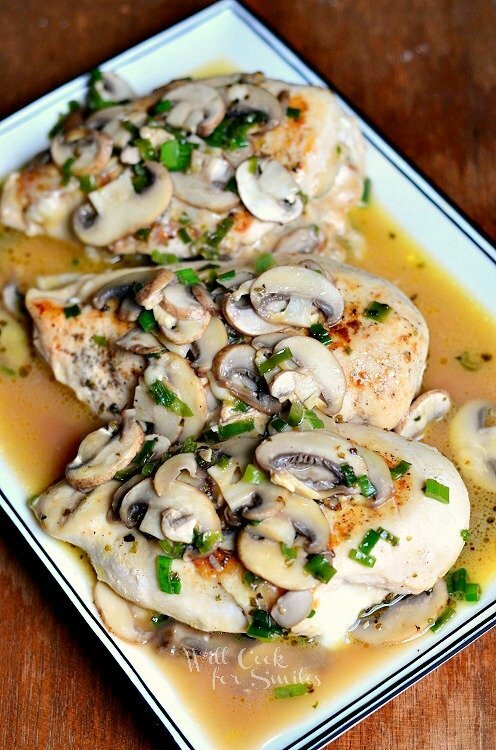 We will just love your Stuffed Chicken Marsala, it looks fabulous! Thanks so much for sharing with Full Plate Thursday and have a great weekend! I hope you give it a try, Miz Helen! It’s so good! This looks yummy! I’m sure my hubby will love this dish! Pinning! Definitely! The cheesiness is awesome! Thanks for sharing at Marvelous Mondays. Pinned and featuring on social media this week! Have a lovely week! You know, my hubby used to not like mushroom until me 🙂 Now, he can’t get enough! 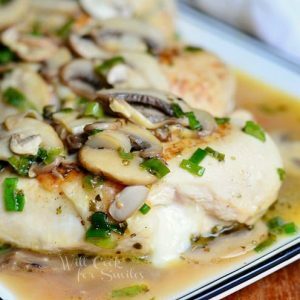 Chicken marsala is my hubby’s favorite! I will definitely have to make this for him! I hope you do, Cathy! Thank you! Lyuba these look SO good! 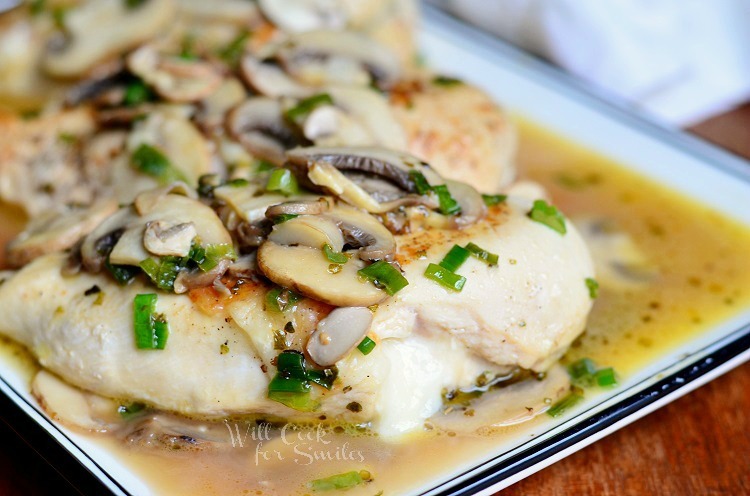 I’m craving chicken marsala now! Your lightened up version doesn’t sacrifice any flavor! SO delicious!! !